SKIOLD provides various of proportioning systems, weighing and dosing systems suitable for your specific needs. Our dosing systems are engineered for successful feed production. Dosage of the individual ingredients included in the finished feed mixture is most important, however, it is a difficult process in feed production. Knowing beforehand which raw materials the dosing machine is handling and in what quantities, is necessary for optimal success. 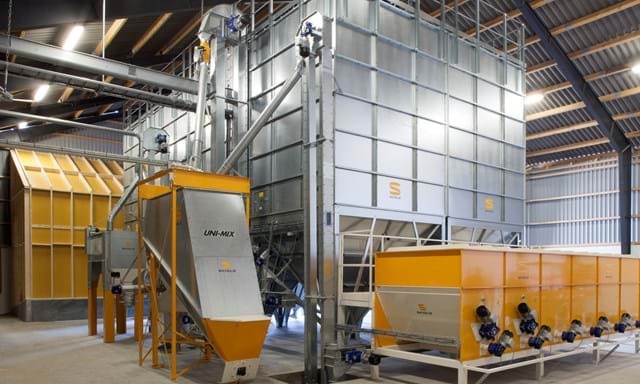 In our selection, you will find equipment in high quality engineered based on our unique experience and knowledge on animal feed. Our research and development department continuously work to make sure all product from flex augers to dosing units are tailored to meet our customer's specific needs. SKIOLD macro dosing systems are used for dosing of raw materials such as grain, protein, etc., with capacities from a few kilos up to several tons per batch. The system is typically built with large silos mounted to a dosing unit such as a tubular auger, flex auger, trough auger, or chain conveyor. It doses the material to a weighing bin for weighing out the requested quantity. The components are dosed and weighed individually and are subsequently transported to the grinding unit for grinding. SKIOLD small components dosing systems are used for correct dosing of premix and minerals with capacities from approx. 1 kg to 100 kg per batch. The dosing system consists of either mineral hoppers and/or round dosing bins, which dose the material into a central weighing bin. The components are proportioned and weighed out one by one and are subsequently transported to the mixer. The mineral hoppers and dosing bins are often filled from small bags or Big-Bags and are available in sizes from 400 l to 1800 l. The dosing unit is a Ø100 mm tubular auger or a flexible auger. SKIOLD micro dosing systems are used for dosing of vitamins, minerals, and premix, in capacities from 500 g to 15-20 kg per batch. Apart from the microdosing silos, the plant consists of a platform for suspension of the silos. The dosing units are mounted in the bottom of the silos, which dose the material to the weighing bin placed underneath the silos. The dosing unit is a centreless, Ø100 mm auger type T100. The bins are available with an agitator for hard flowing materials and in a stainless edition suitable for aggressive materials. The mini dosing system from SKIOLD works according to the "loss in weight" principle and is suitable for very accurate dosing of micro components such as vitamins or acids in dry form. The dosing unit is a Ø45 mm auger in stainless steel. The mini doser is typically used for dosing of a few hundred grams and up to 3-5 kilos per batch. The basic unit consists of 1 to 3 dosing bins. The system can be extended with additional bins if required. The mini proportioner can easily be incorporated into existing plants, which is one of its main advantages. SKIOLD mineral hoppers are available in two sizes, 400 and 700 liters. They are primarily used for premix mixtures to be conveyed to the mixer or liquid feeding tank. When handling difficult raw materials (e.g., fish meal) the hopper can be supplied with an agitator. A stainless steel edition is available for aggressive materials.